A cocky NY publicist picks up a ringing public phone, and is told that if he hangs up, he'll die. 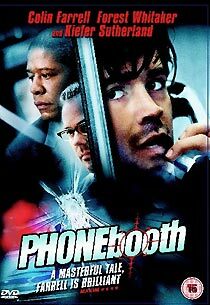 Phone Booth is a slick thriller that immediately grabs you by the scruff of the neck, and doesn't let go for the next seventy-two minutes. Joel Scumacher invests the film with film with prodigious energy, making the film work like a well-oiled machine. The script develops its lean, unlikely premise carefully and, although there are a few clunky moments, the story unfolds naturally. The film isn't long enough to present its supporting characters in any depth, so instead it wisely focuses almost exclusively on its protagonist, Stu Shepard, an obnoxious Bronx publicist. The whole film revolves around Stu, a role which demanded - and received - an outstanding performance, from Daredevil's Colin Farrell. It's worth noting here that it was Schumacher who gave Farrell the role that propelled him on the way to stardom, in his 2000 movie Tigerland. Fox's Region 2 DVD offers the film in its original 2.35:1 aspect ratio, with anamorphic enhancement, presented over both layers of a dual-layer disc. The Region 1 disc offers a choice of letterboxed and pan-and-scan versions (on either side of a dual-sided, single layer disc). It's easy to see how the film would be destroyed with half the frame cropped. It was shot in Panavision format, and Schumacher makes great use of his wide canvas, including numerous shots which feature split-screen action to show several things happening simultaneously, or to convey flashbacks, or to show more than one side of a phone conversation. The transfer is generally fine, although the colours often seem conceptually drab (perhaps accurately reflecting the quality of light in New York). Contrast levels are a little inconsistent, and there are frequent signs of excessive edge-enhancement, but there are no obvious encoding artefacts. The average bitrate is a respectable 5.96Mb/s. The Dolby Digital 5.1 audio (at 448kbps) is not especially adventurous or innovative, but is cleanly-recorded, and offers a good sense of ambience. Perhaps the most remarkable aspect of the mix is the use of directional dialogue (i.e: dialogue which isn't locked to the centre channel), for the scenes where split screen is used. It's also interesting to note that the "the caller"'s voice is unfiltered. Conventionally, a voice on the other end of a phone is altered to suggest the limited dynamic range offered by the earpiece. Here the voice appears as a phantom presence in the phone booth alongside Stu. It's an interesting directorial choice, but one which isn't entirely successful. English subtitles are provided for the film, the commentary, and the featurette. The film is supported by a lacklustre, half-hearted commentary track by Schumacher, which was recorded before the film received its long-delayed theatrical release. A lot of questions go unanswered, and, despite the brief running time, he runs out of steam towards the end. There's also a chunk where Schumacher stops speaking, so that the viewer "can have this little moment", which is a particular annoyance. Another bugbear is that the commentary ends shortly after the end credits start to roll. Although silence is preferable to the all-too common practice of inanely name-checking people as their names appear on-screen, the end credits would seem to provide the ideal opportunity for the director to summarise his feelings about the film. Finishing a commentary four minutes before the film ends makes it seem like it was a chore. The disc makes up for the commentary track with The Making of Phone Booth, a rewarding twenty-eight minute documentary that offers a good sense of the movie's breakneck filming schedule. A normal shooting schedule would be about forty days: Phone Booth was shot in twelve. Even though the film is quite short, there are so many split-screen shots that the production probably shot as much material as a full-length movie. To complicate matters it was shot on location, in winter, meaning that the natural light would begin to disappear at 4pm. Shooting so quickly made enormous demands of Farrell, who would routinely have to learn and deliver twelve to fourteen pages of dialogue a day. Schumacher is the featurette's main contributor, but, as if to acknowledge the Herculean efforts of the entire crew, there are also contributions from several people you rarely hear from, including the on-set stills photographer and the second second assistant director (whose role, it seems, is to prep the background extras). The last third of the featurette is devoted to the filming of the film's pivotal confession scene, which, according to the commentary, was shot in one take. The featurette also offers a good look at the story's antagonist, who is mainly seen in the film in oblique, distorted shots. The disc opens with trailers for Antwone Fisher, X-Men 2 (the relatively rare "Coming 2003" teaser trailer, which doesn't feature any footage from the film itself), and In America. These can be fast-forwarded through, or skipped entirely using the Menu option.